I'm not a religious gal. If you want to slap a name on my status, you can call me an atheist. Though I don't believe it matters much. Religious or not, people are who they are. I believe, in the end, that people are fundamentally good, that they genuinely want to be happy and do unto others as they would have done unto them; and not because they're afraid of hell or hoping to live eternally in paradise with their friends and family - but because they feel better when they do good, because being a good person is in itself pretty damn rewarding. It's our fears and insecurities that really mess it all up. And how tragic when the solution is clearly love, respect, honesty and again, love; loving ourselves and others. I've been griping lately about the NOTW stickers I see all over San Diego roadways. I even looked it up online to see what the hell that was supposed to mean - why is it a good thing to be of another world? a different place? when all we have is here and what we have is so beautiful and fabulous and really, all we know? My search led me nowhere and I had half given up trying to understand it. Then the other day, I was enlightened to the fact that to the church-going population, I am known as a "worldly" person. (to which I immediately replied: well, thanks! you guys know that's a compliment, right?) But ah, I got it - not of this world because you don’t follow the ways of the world but instead follow the ways of your god. Hence, godly peeps. Needless to say, it was an ah-ha moment for me. So, I suppose keep your ugly (sorry, that opinion just keeps slipping in…that's what she said?) stickers and proclaim your godliness. 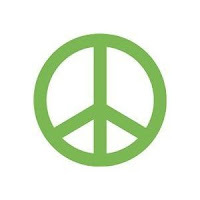 If I can put a peace sticker on my car and expect it to convey a happy message, you can do the same. Though, I wish we'd all consider that this world is all we have and the people around us are all we know and that maybe those facts are enough to make us appreciate our reality. Embrace the tangible and love it. For neither book nor sticker is needed to enjoy it. the word of the blog. I completely agree with all of this, completely. I'd also class myself as an atheist. I think what you said here "I wish we'd all consider that this world is all we have and the people around us are all we know and that maybe those facts are enough" is absolutely right. Well said, lady. Brought a little tear to my eye!